Irving, TX Owner Operator, Jose Aragon was named Driver of the Year for 2018. 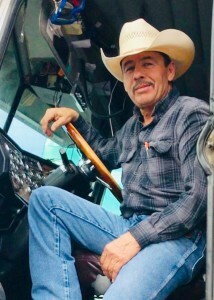 With over two million miles without an accident he began driving at National Carriers in 1997. Aragon was honored during the Driver of the Year banquet held in Arlington, Texas. Each driver of the month during 2018 was recognized for their excellent service. National Carriers, Inc. President, Jim Franck, presented Aragon a ten thousand dollars bonus check during the Willie Nelson themed celebration. Over 150 people attended the catered affair held at the Bill Duncan Center. The banquet concluded with a meal provided by Soul Man’s BBQ. Known for his outstanding business acumen, work ethic, and personal appearance, Aragon is a leader in the livestock division. He began his career with National Carriers in September of 1997. His son, Andrew joined his father hauling cattle at the “Elite” Fleet in 2017. Together with the remaining cattle truck operators, the Aragons transport cattle to National Beef Packers plant in Liberal, KS.